"Gadh Ne Honkaro To Kangray Deshe... Pan Gadh Ma Honkaro Kon Deshe"...(literally : The parapets of the fort will assert .... but who will support from inside the fort ? " 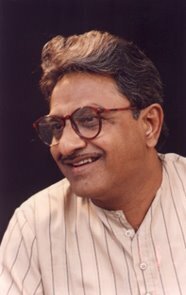 I knew it was something great because Papa was so overwhelmed by it... .. and the following years explained every bit of the greatness in each line of that lovely poem... and more than the poem... the poet, Ramesh Parekh or fondly known as RaPa. ... then came a day when I got a chance to meet him. Dad asked me to collect some books which he had lended to RaPa. I was thrilled at the opportunity.... and at once was on my way... I was somewhat surprised to see his house... It was one of the most humble house in that locality. Although, I was prepared for it, but still you always get a shock when you actually see it. I couldnt help scrolling my eyes thru the house. It was a modest 2 room house with the most basic furniture. In a corner, there were 4 shelves full of books, the only things that exhibited the living of a proud and gutsy poet. He usually wore a Khadi Kurta and always had Pan in his mouth. Thats all what, I think, he needed to create a sea of emotions. I was awestruck by his simplicity and the way he went on to introduce me to his family. I was wondering then, how come a person stay ignorant of the countless awards bestowed upon him and still be so humble. I know being a poet in India means... this kind of a life. One has to be a wanderer... One has to give up all the hopes of a good life-style and all other mundane things and still going on writing epics about life... but in Gujarat, the situation is worse... The government knows less about literature than Narendra Modi about religious tolerance. The most coveted prize in literature will give you a sum of Rs 5000 that ofcourse, if you are the sole awardee (yes, sometimes, it gets divided among two poets/writers) and nobody has asked for a pie from it... and the tragedy is you can do nothing but to buy his books and feel sorry about the situation. Two days back, one of my dad's friend and a prominent Gujarati poet, went to buy some poetry collections from the discarded books market. What he found was utterly painful for the fans of RaPa. He found hundreds of books piled up of different Gujarati poets. There was a striking similarity in all those books... the books were signed by the author of the book and were sent to Ramesh Parekh as gifts... and all of them read... "With Love to Ramesh Parekh"... It struck me there... These were the books I saw on the day I visited his home. Dad's friend asked the seller, where did he get the books from. His answer was... "Just got two bags full of these books as trash from one of the houses in Hanuman Madhi"... It was where RaPa lived... and these were the reasons why Rapa lived... being sold at 5Rs per Kg. "Nathi Samato Aaj Have To Hu Aa Mara Chh Aksharo Ma"
"Cant live now .... in these six letters of mine"